Most dogs love to play outside. If you don’t have a good place for your four-legged friend to run around and play, you can bring them to a dog park. The Indianapolis area has several parks designed for dogs. These have open spaces where the dogs can run, and best of all, your pet can play with other dogs while you sit and socialize with the other dog owners. Play with your pooch at one of these Indy dog parks. Broad Ripple Dog Park on Broad Ripple Avenue is an off-leash park. To use the park, you need to have a Pooch Pass, which you can buy at the Broad Ripple Park office. Make sure to bring proof of vaccinations for parvo, distemper, rabies, and bordetella when you purchase your pass. Bring your dog to Paul Ruster Bark Park on East Prospect Street and they can play off-leash with other dogs. This park also requires a Pooch Pass and proof of vaccinations, which you can get at the park office on Post Road. The park has two fenced-in areas that are always clean and well taken care of, and if you enjoy hiking with your dog, there are also trails you can access from the park. Smock Bark Park sits on East County Line Road and has a large fenced-in area for the dogs to play. There are bowls around the park, but you need to bring your own water. Many people will bring extra water to help fill the bowls for all the dogs. The Waggin’ Tails Bark Park is a fun place for your dog to play, and there is also agility equipment if you want to try out some training. Bring your dog through the obstacles and see how much fun they have. This park has benches for you to sit on while your dog plays, and there is a water fountain so you can fill up your pet’s bowl. This park sits just outside Indianapolis in Lawrence, Indiana. You can purchase a one-year membership to the park for $40 per person and $25 per dog. Nonresidents are also welcome to buy a membership for $50. The dog park at the Humane Society of Indianapolis is a great place to hang out with your dog. It has a large fenced-in area with agility equipment for the dogs and picnic tables for the people, and there are hiking trails in the woods next to the park for everyone to enjoy. In order to use the park, you’ll need to fill out an application and provide proof that your dog is spayed or neutered, and also provide proof of vaccinations. 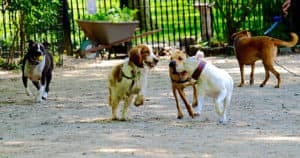 Bring your dog to one of these Indy dog parks so they can get some exercise, play with other dogs, and enjoy the fresh air.